We’d love your help. Let us know what’s wrong with this preview of The Names They Gave Us by Emery Lord. When it all falls apart, who can you believe in? Everything is going right for Lucy Hansson, until her mom’s cancer reappears. Just like that, Lucy breaks with all the constants in her life: her do-good boyfriend, her steady faith, even her longtime summer church camp job. Instead, Lucy lands at a camp for kids who have been through tough times. As a counselor, Lucy is in ov When it all falls apart, who can you believe in? Instead, Lucy lands at a camp for kids who have been through tough times. As a counselor, Lucy is in over her head and longs to be with her parents across the lake. But that’s before she gets to know her coworkers, who are as loving and unafraid as she so desperately wants to be. To ask other readers questions about The Names They Gave Us, please sign up. Why is this book called the names they gave us? Jules I think it's because the book is centered around a camp for troubled kids. Daybreak has everything from pregnant 14 year olds to transgenders to…moreI think it's because the book is centered around a camp for troubled kids. Daybreak has everything from pregnant 14 year olds to transgenders to abused children. Everyone at this camp would have been called names at some point; been judged and given a label. The pregnant 14-year old, perhaps would have been called "whore" maybe the transgender was bullied relentlessly. But at Daybreak, each and every one of these people-whether they are counselors or campers- are respected and not defined by their struggles. The names they were given are no loner meaningful at this safe haven in the woods. Does Lucy's mom die at the end? This answer contains spoilers… (view spoiler)[ In the end, Lucy's mum gets rushed to the ICU and she's at the hospital with her friends and dad. And that is literally the END! …more In the end, Lucy's mum gets rushed to the ICU and she's at the hospital with her friends and dad. Wow...that was fantastic! I really didn't think I would connect with this story because I usually shy away from stories focused on religion, but I was so wrong. This story was beautiful, heartbreaking and powerful. Definitely my favourite Emery Lord novel I've read. Highly recommend it! Emery Lord is an auto buy author, so I don't even read the synopsis of her books any more. I just know I'm going to love them. Love love loved Lucy. She's an amazing character: strong, loyal, curious. I truly enjoyed being in her head and reading her struggle. Her found group of friends were fantastic and I adore the way Emery writes every friendship like its ride or die. And her parents were perfection. The underlying theme of this story is Lucy and her faith. I'm not particularly religious, so w Emery Lord is an auto buy author, so I don't even read the synopsis of her books any more. I just know I'm going to love them. The underlying theme of this story is Lucy and her faith. I'm not particularly religious, so when I saw that, I was a little reserved about how it could possible take over the story. And it totally does, but in the best way possible. This book was a quiet heartbreak I wasn't ready for. It does have its swoons and banter like always, but there's so much feeling in it. It made my cold, black heart beat a little faster and nearly cry twice. If that's not a glowing recommendation, I don't know what is. I have always found the faith of others to be a beautiful thing, but also something that has always been distant from my own life, asides from one summer when I was nine-years-old where I convinced myself I was going to become a nun after seeing Julie Andrews in 'The Sound of Music'. Through Lucy's exploration of Christianity the reader is invited to experience faith from an inside perspective. And through Lucy's loss of it we are also invited to analyse our own opinions and stance on religion. I have always found the faith of others to be a beautiful thing, but also something that has always been distant from my own life, asides from one summer when I was nine-years-old where I convinced myself I was going to become a nun after seeing Julie Andrews in 'The Sound of Music'. Through Lucy's exploration of Christianity the reader is invited to experience faith from an inside perspective. And through Lucy's loss of it we are also invited to analyse our own opinions and stance on religion. I have previously only ever viewed these aspects from a distance and admired the beauty of belief from a cursory level. Here, I was invited inside the fold, as it were, and truly got to experience what faith, and the loss of it, felt like. This is a really hard one for me to review. While I enjoyed this book for the most part, I found myself to be really bored most of the time and had a hard time connecting to the characters. HOWEVER, I definitely think this is a personal preference thing and I feel like other readers could get much, much more out of this than I did. Here’s hoping that Emery’s other books fare better for me! This was a YA contemporary story about a girl whose Christian faith was tested when her mother was diagnosed with breast cancer for a second time. Lucy was an okay character and I felt really sorry for her and her family. Going through a breast cancer diagnosis must be super hard, and to have to face it twice felt really unfair, and I could see why she stopped praying for a while. The storyline in this was about Lucy’s mom asking her to be a counsellor at a camp for troubled teens instead of at her parent’s church camp, and Lucy doing it because she knew it would make her mom happy. We also had Lucy’s faith being tested by the diagnosis and a bit of a romance storyline, with Lucy’s boyfriend Lukas ‘pausing’ their relationship at such a hard time for her, and Lucy finding another romantic interest at Camp Daybreak. The pace in this was so slow though! After the initial getting to camp was over, it was just day-to-day camp activities, very little romance, and even Lucy’s mom’s cancer seemed to take a back burner which was surprising for me as it felt like it should have been the main storyline. The ending to this was a big disappointment for me as the story seemed to just leave us hanging, and it didn’t feel like a proper ending at all. Sometimes you read a book and you just don’t know what to even say about it. It is pretty much perfect in all the ways that surprise you yet don’t surprise you at all. It will make you feel things as you read, make you cry, make you laugh, make you swoon. That is what The Names They Gave Us did to me. In typically Emery Lord fashion I was blown away by this books beauty and realness. Lucy’s friends at the new camp are truly amazing and inspiring. They are all dealing with something whether it is anxiety or illness or abuse. They all have some kind of baggage but they also don’t carry that baggage alone. They let each other help and they rely on one another for support. It is the definition of a true friendship. And they willing, okay, some more than others, take Lucy into their fold which is something she needed desperately without even knowing it. And this isn’t even talking about the beauty that is Henry and what he adds to the change in Lucy. Gah. I’m smiling just thinking about Lucy and Henry. Truth, I’m not convinced Emery Lord is human. Okay well I know she is because I have met her, but still. The Names They Gave Us is Emery’s 4th book (I’ve been a massive fan since Open Road Summer) and her 4th book to completely blow me away. Every time I read a book by her I think her next one can’t be better and then I read the next one. It’s unfathomable yet she manages to do it every time. There is something just so magical about her books. I swear if you are not a fan yet you will be as soon as you read something with her name on it. Make sure you add The Names They Gave Us to your TBR. Lucy's mom is sick. She has cancer. Her long time boyfriend puts their relationship on pause. Her dad is a pastor. Religion and faith have always been a key part of their lives but this fateful summer instead of attending church camp Lucy's parents encourage her to become a camp counsellor at another camp. A camp where everyone has a past... As Lucy struggles with her faith, with judgment, and with discovering who she truly wants to be in this life she somehow learns more about herself in a few Lucy's mom is sick. She has cancer. Her long time boyfriend puts their relationship on pause. Her dad is a pastor. Religion and faith have always been a key part of their lives but this fateful summer instead of attending church camp Lucy's parents encourage her to become a camp counsellor at another camp. A camp where everyone has a past... As Lucy struggles with her faith, with judgment, and with discovering who she truly wants to be in this life she somehow learns more about herself in a few short months than she has in all her previous seventeen years. A sweet and well-intentioned coming of age story featuring a wonderfully diverse cast of characters. It's nice to have a book that looks at a regular teenager who wants to be just the same as anyone else but also struggles with her faith. That was the best part of the storyline. Sadly though things were all a little bland, a little too cosy and sweet and the twists of the plot didn't feel altogether that surprising even if it was nicely written. All right. This will be short. I really enjoyed The Names They Gave Us! It was a light-but-not-too-light contemporary, and I liked that. BUT I do think that the reason I liked it as much as I did was because of Anna, Keely, Jones/Henry (I CANNOT CALL HIM HENRY FOR SOME REASON), and Mohan. If those four didn't exist, along with Camp Daybreak, I WOULDN'T HAVE CARED ABOUT THIS BOOK. They are honestly EVERYTHING in the book -- so intriguing, hilarious, and just AMAZING. (I also really enjoyed Rachel' All right. This will be short. BUT ALSO. THAT ENDING. HOW DARE EMERY LORD LEAVE US ON A CLIFFHANGER LIKE THAT??? Does anyone know if there's a sequel??? BECAUSE I NEED TO KNOW WHAT HAPPENS TO LUCY'S MOM. What can I say - this book deserves every single positive review it gets. It's so beautiful, so full of amazing character development, wonderful friendships, an absolutely heartwarming romance. It's a melancholic, sad Contemporary but never fails to make you laugh. While I think anyone, at any age, can read YA, I feel like this is a YA book in particular that I would recommend to everyone. I think there's something eye-opening in here for everyone. Read this book for my hometown book club.... It was meh. "Everything is going right for Lucy Hansson, until her mom’s cancer reappears. Just like that, Lucy breaks with all the constants in her life: her do-good boyfriend, her steady faith, even her longtime summer church camp job. Instead, Lucy lands at a camp for kids who have been through tough times. As a counselor, Lucy is in over her head and longs to be with her parents across the lake. But that’s before she gets to know her coworkers, who Read this book for my hometown book club.... It was meh. I just started reading Emery Lord last year and she has gradually become an auto-buy author for me. She has such a way with words and characters that each book is utterly unputadownable. This story does deal with tough subjects such as cancer and religion, (I know what you're thinking - ugh cancer, ugh religion - no thanks) but don't let that scare you off! If you've read any of Lord's previous work then you know that the hard subjects are what she excels at. Cancer stories hit a little too clos I just started reading Emery Lord last year and she has gradually become an auto-buy author for me. She has such a way with words and characters that each book is utterly unputadownable. This story does deal with tough subjects such as cancer and religion, (I know what you're thinking - ugh cancer, ugh religion - no thanks) but don't let that scare you off! If you've read any of Lord's previous work then you know that the hard subjects are what she excels at. Cancer stories hit a little too close to home for me but I can assure you that Emery Lord handles every topic with respect. Lucy is a Christian and daughter of a pastor so Religion plays a huge part of the book, yes, but it's not in a bad way at all like you may think. Lucy has her beliefs and sticks to them but she's not judgmental towards anyone else's nor does she push her religion on others. She is open minded, loving, and accepting. Though, that's not to mean that she is perfect, far from it. In The Names They Gave Us you will explore a girl who begins to question her faith. "For the first time in my life, I consider that I am being looked down on by no one, by nothing." A camp for troubled kids, with a group of counselors all carrying around their own heavy baggage. A huge array of diverse characters. Failing in love. Grief - how to deal with it and still live your life. And at the core of this story is family and friendships and finding your "herd". "And I want to be one of them. I want to be one of them so, so badly -- to fit into this balance, their history, the wolf pack way of them." Emery Lord never ceases to amaze me. She has a magical way of weaving words and creating flawed, complex characters that are entirely relatable. I loved every single one of these characters and that's no exaggeration. Even though this book deals with a lot of heavy topics, there is still much fun to be had! Highly recommend this for your summer reading. This is hands down my favorite read of the year. I hope everyone will give this book a chance if reading hard-hitting contemporaries is your thing. I rarely rarely rarely read a book that makes me cry, and this book made me cry five times like a big fat baby. It was so beautiful, so heart-warming, and so sad. The writing was amazing and lyrical, the protagonist was relatable, well-developed, unique, and showed a great character arc throughout the story. The secondary characters all had their own This is hands down my favorite read of the year. I hope everyone will give this book a chance if reading hard-hitting contemporaries is your thing. I rarely rarely rarely read a book that makes me cry, and this book made me cry five times like a big fat baby. It was so beautiful, so heart-warming, and so sad. The writing was amazing and lyrical, the protagonist was relatable, well-developed, unique, and showed a great character arc throughout the story. The secondary characters all had their own voices, and there was a ton of diversity. There was an amazing friend group and family bonds as well! I personally related to this book and the main character so much. As a Christian, I understand how grief and death can leave you feeling so angry with God. I experienced the same thing when I was younger, and it was a breath of fresh air to know that there is a book that I can relate to about that time in my life. I love seeing how Lucy's faith evolved and knowing her thought processes. This book truly warmed my heart, especially seeing her accept people different than her and making amazing friends that she never had before. I don't know how else to say how much I loved this book but if this is something you have experienced, GO READ THIS BOOK! I’ve shied away from contemporary YA over the last few years, only rarely dipping my toes back in if someone recs me a specific book. The subgenre has been dominated by first person narrators of late, and that’s something I often struggle to connect with, but I’m always looking for more YA to read. Emery Lord came highly recommended by a friend, so I jumped at the chance to read The Names They Gave Us. It was astonishing. This book is a very tough, emotional read handled with a deft touch and cl I’ve shied away from contemporary YA over the last few years, only rarely dipping my toes back in if someone recs me a specific book. The subgenre has been dominated by first person narrators of late, and that’s something I often struggle to connect with, but I’m always looking for more YA to read. Emery Lord came highly recommended by a friend, so I jumped at the chance to read The Names They Gave Us. It was astonishing. This book is a very tough, emotional read handled with a deft touch and clean, beautiful prose. The world and its ensemble of characters are vivid and diverse, the dialogue is pitch perfect for teenagers, and the feelings ring incredibly true. I received a copy of this novel from the publisher via Netgalley, in exchange for an honest review. The Names They Gave Us is a moving story in which we follow Lucy, as she is challenged in her faith when her mother is diagnosed with cancer - after already beating it years ago. Instead of going to church camp with her parents as she does every year, her mother wants Lucy to go to Daybreak camp, which is a camp for kids and teens that have been through a lot. Lucy is hesitant but very quickly she I received a copy of this novel from the publisher via Netgalley, in exchange for an honest review. Instead of going to church camp with her parents as she does every year, her mother wants Lucy to go to Daybreak camp, which is a camp for kids and teens that have been through a lot. Lucy is hesitant but very quickly she starts to enjoy herself at Daybreak, makes friends, and rediscovers her faith. UPDATE May 14: I did read this and overall I'm glad I did. But for those of you who are hesitant to read a cancer book, here's a heads up that illness and other types of loss and the sorrow and despair that go with them were a thread that ran strongly through the entire story. As always, Emery Lord's writing is lovely. Most of the book takes place at a camp for kids who have suffered some sort of loss or trauma. Lucy's mom asks her to go there for a bunch of reasons, one of them being that Lucy's UPDATE May 14: I did read this and overall I'm glad I did. But for those of you who are hesitant to read a cancer book, here's a heads up that illness and other types of loss and the sorrow and despair that go with them were a thread that ran strongly through the entire story. As always, Emery Lord's writing is lovely. Most of the book takes place at a camp for kids who have suffered some sort of loss or trauma. Lucy's mom asks her to go there for a bunch of reasons, one of them being that Lucy's mom has breast cancer that has recurred. Before Lucy arrives, her boyfriend has just put their relationship "on pause" so she's free to fall for another guy, which she does. The counselors and campers were a wonderful bunch, my only gripe being that there were a bunch of characters and first the counselors are introduced by last name and then the book switches to calling them by their first names. To me, the book was exploring how people go on living in the face of terrible things, or as the book puts it, "being okay and not okay all at once." When things are like that, it is comforting to be around other people who get it, though the book acknowledges that's a temporary thing. "I want to go back to when I felt like nothing could hurt me," Lucy says at one point. SET BOOK ASIDE on May 7: Read a few chapters and I just can't do this one. I used to love sad books but I don't feel that way any more. And I really can't read any more illness books. The synopsis was worrisome but I decided to try this. I had a knot in my stomach the whole time I was reading and had to stop. Peeked at the ending and that didn't make me feel much better - and that's not a spoiler! Just saying that the illness theme runs throughout the book, which was one of my concerns. This book started off really slow and pretty boring for me I was seriously think I wasn't in the mood for it and about to put it down for another time THEN something magical happened. We get a whole freakin cast of amazing character that had heartbreaking back stories and amazing relationships with each other. This camp, these character, the diversity (that should be in EVERY contemporary) every character had a backstory, every character was messy and lovely, the romance was so cute, and the stru This book started off really slow and pretty boring for me I was seriously think I wasn't in the mood for it and about to put it down for another time THEN something magical happened. This camp, these character, the diversity (that should be in EVERY contemporary) every character had a backstory, every character was messy and lovely, the romance was so cute, and the struggles and hardships everyone faced felt so real. in honor of two weeks until pub date, here is my review! Thank God for this book, honestly. And thank Emery Lord for writing it. I... am in awe. Every word of this was like a balm to the soul. I really don't have the words to talk about it right now, but I felt the full spectrum of emotions reading this, in their purest forms. Glee, giddiness, love, sorrow, pity. I felt surrounded by the love of friends and family, found and born with. I just... I'll post a review closer to pub date, but you guys in honor of two weeks until pub date, here is my review! Put on hold 8/29/17: Soooo. I tried reading this. I really did. I started and made it to about 3% and it already was too much. I wasn't all about "cancer books" before I had a personal connection to it and it's crossed from a preference to the fact that I just can't do it. I'm putting my energy into keeping cancer out of my thoughts so I can't bring it back into my life with a book. Maybe once I'm further removed from things personally, I'll try again but I can't read this book right now. I FLEW through this book. Nearly in one sitting. It was beautiful and full of character growth, the cutest relationships, and gorgeous writing. I loved loved LOVED the friend group in this book. Our main character Lucy finally figures out what it means to have deep, meaningful friendships and it made my little heart ache for her. All of the characters in this book are going through a lot. It's definitely not an easy read in terms of hard topics, but 100% an easy read when it comes to time. oh this book was beautiful! we follow the tale of lucy who goes into summer knowing her mother’s got cancer again, her boyfriend has put their relationship on “pause” & has agreed to become a counsellor at a camp for troubled kids. i did not think i’d love this book as much as i did! i loved the main character and how this story was a lot about her and growing up and finding herself as well as her faith. i loved the friendship between the main character and keely & anna & mohan & h oh this book was beautiful! i loved the friendship between the main character and keely & anna & mohan & henry. and the relationship in this book was lucy and her mother was written gorgeously. and the romance wasn’t forced! i wasn’t even a main subject in the story but loved how it exceeded! THE DIVERSITY IN THIS BOOK WAS STUNNING. we had a character who was trans. several black characters and other races. we had someone with anxiety disorder. and many kids with differen’t family backgrounds. and not to mention a plot twist i didn’t see coming! I have read all of Emery Lord's books so far and it's beautiful to see her development as a writer. The Names They Gave Us is by far her best book in my opinion, though I thought When We Collided was amazing, and I have a special place in my heart for The Start of Me and You. But this one is on another level. I might even write a review once I've recovered from this overload of feelings. One of my favourite YA contemporaries ever! My god, Emery Lord sure can write. I love how poignant and emotionally explored this book is. Such a gem. I highly recommend it! A few minutes after finishing The Names They Gave Us, with a teary face, I sat down and thought to myself “How does she keep doing this to me?”. She being, Emery Lord, author who likes to destroy me with feels. I’ve read all four of her books now and every one of them has been an emotional and memorable read that I will always cherish. 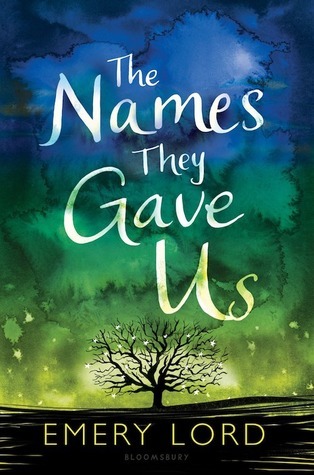 The Names They Gave Us, was just … gorgeously written, and for now, it is my second favorite book from her. Despite being religious, I always think to myself that I won’t enjoy books that have a focus on faith and religion. Having read several books now, I know that there are actually authors who can write stories about faith without coming across as preachy. I honestly think that it’s important that there are books out there for teen about teens and their relationship with faith, which is why I think The Names They Gave Us will resonate with many readers. Grace has a complicated relationship with her religion, and I absolutely loved how Emery Lord depicted that here. A lot of her doubts, the sometimes shaky foundations of her faith, the strength of her relationship with God resonated with me on many levels. I saw a lot of my teen AND current self in Grace. Grace wasn’t just all about her religion. She was a sweet girl, really struggling with the resurgence of her mother’s cancer and how that affects her relationship with her religion. Deep down, she was an inherently good person and throughout the book you really see her goodness come out in the small, but consequential scenes. The Names They Gave Us wasn’t just Grace’s story of coming to terms with the ongoing changes in her life. Her family life, the new friendships she forges and the romance she finds, all add to her story. Grace’s parents were such important figures in her life. I loved how much of a role they played here, and how involved they were in her life. Not only that, but they were not portrayed as the stereotypical pastor and pastor’s wife that you sometimes see. They were open-minded and kind and absolutely loving. Some of my favorite scenes in The Names They Gave Us were Grace’s scenes with her parents. The new friends that she makes at her camp, were another highlight for me. This was such a diverse cast in race, ethnicity, gender, sexuality and personalities, and I absolutely loved that. They were all very different from each other, but they still fit together seamlessly. They made me laugh, think and sometimes, tear up. Then there was Henry, Grace’s love interest, who as with all Emery Lord book boyfriends, made me swoon with his charm, kindness and loving nature. Henry was a sweetheart, and his slow growing relationship with Grace was awkward, sometimes complicated, but so sweet and swoony. Their kisses and conversations made me positively giddy. Lucy Hansson finds glory in the inspiration of Our Father, a passionate parishioner honouring thy father and thy mother. A wonderful community of support for the sixteen year old high achiever. Lucy's character is delightful. She's a wonderfully positive young woman with a tremendous sense of community for her fellow parishioners. Her strong Christian beliefs extend to her relationship with fellow Christian Lukas until Lucy challenges the boundaries of their physical relationship. Daybreak is a s Lucy Hansson finds glory in the inspiration of Our Father, a passionate parishioner honouring thy father and thy mother. A wonderful community of support for the sixteen year old high achiever. Lucy's character is delightful. She's a wonderfully positive young woman with a tremendous sense of community for her fellow parishioners. Her strong Christian beliefs extend to her relationship with fellow Christian Lukas until Lucy challenges the boundaries of their physical relationship. Daybreak is a summer program for children and teens enduring grief, displacement and despite Lucy's reluctance, she accepts the position of counselor to satisfy her mother. The Names They Gave Us explores adolescence grief and acceptance. Lucy's mother is breast cancer survivor although in the summer of Lucy's senior year, her mother is rediagnosed and scheduled for surgery. Lucy begins to challenge her Christian ideology, an aspect of the narrative I found fascinating. Lucy is a compassionate humanitarian but her ideology often leads to the judgement of others, including a pregnant young lady seeking guidance. Lucy's character encounters a diverse and wonderful company of counselors who have all experienced trauma or loss throughout their young lives. In particular gentle Anna and the magnificent Henry. The delicate romance between Lucy and Henry was captivating. Daybreak is a positive and maternal environment and the counselors all share a wonderfully affirming perspective. Although Christianity and illness are components of Lucy's narrative, The essence of The Names They Gave Us is compassion. Through her interactions with fellow councilors, Lucy experiences a sense of belonging and immeasurable admiration, now accepting of new experiences guided by the group of diverse, young individuals. African American adolescents, transgender, exploring sexuality, displacement, socioeconomics, race, religion, anxiety, grief, adoption and illness. Both children and councilors were wonderfully representative of our diverse communities. Unfortunately it ended rather abruptly and I needed closure. "I believe in nature, in science, in jazz, in dancing. And I believe in people. In their resilience, in their goodness." The Names They Gave Us was so freaking good. It was raw and emotional, and of course the writing was lovely, just like every other Emery Lord book. I’ll admit the beginning was just a bit slow, which is why I gave it 4 stars instead of 5, but it truly was amazing! Honestly I don’t even know what happened, but this whole cast of characters felt so authentic to me. Maybe it’s because I’m a sucker for friends who support and love each other, yeah, yeah, I love it. This group of friends – Lucy, Anna, Jones, Keely, Mohan – were inspiring, and this is so rare to find in YA. Lucy Hansson, the daughter of a preacher, has grown up with her faith, she relies on it to get her through tough times, like when her mom gets diagnosed with breast cancer for a second time. She’s looking forward to spending the summer with her parents at their church camp, but soon decides to volunteer as a counselor at a camp for troubled kids after her mom begs her to. Lucy’s beliefs, and her doubts, do play a big part in story but it’s never overwhelming. There’s not a whole lot happening plot wise, but like I said the characters are very fleshed out and diverse. They are the reason you’ll love this book. Lucy is by no means perfect, but she’s accepting and open-minded though she can be naïve at times. Watching her evolve and make these new friendships was so wonderful to read about. There is also a romance here, and I’ll just say that it’s very… sweet. It never takes over the story, but it is an added perk to the book and it’ll keep you smiling throughout. I raved about When We Collided for months after it brought me out of a reading slump and became one of my favourite books. I wanted more of Emery Lord's beautiful writing and so I couldn't wait to get my hands on The Names They Gave Us. (I still haven't picked up her first two books, but I very recently bought The Start of Me and You!). Lucy Hansson has her life all figured out until her long-term boyfriend 'pauses' their relationship over the summer and her mum's cancer comes back. To help her c I raved about When We Collided for months after it brought me out of a reading slump and became one of my favourite books. I wanted more of Emery Lord's beautiful writing and so I couldn't wait to get my hands on The Names They Gave Us. (I still haven't picked up her first two books, but I very recently bought The Start of Me and You!). Lucy Hansson has her life all figured out until her long-term boyfriend 'pauses' their relationship over the summer and her mum's cancer comes back. To help her cope with the upheaval, her mum suggests that she work for a camp for troubled young people instead of her usual Bible camp, so Lucy heads to Camp Daybreak. I thoroughly enjoyed the summer camp setting. It made me feel the same way boarding school stories do, probably because it's something I haven't experienced. I nearly applied to work for Camp America (and then shortly after remembered that children intimidate me, shh). I wish I had done it because it would've been an excellent life experience, as Lucy discovers. I loved watching Lucy make new friend and become more open-minded. I was hesitant about the religious aspect, being an atheist who went to a Catholic school, but there's still a lot to enjoy about The Names They Gave Us. It has been nearly three months since I read this book but the scene of the campers being sorted into their Hogwarts Houses still sticks in my mind. The Names They Gave Us hasn't replaced When We Collided as my favourite Emery Lord, but I adored the entire cast of characters, from the camp counsellors to the campers and Lucy's family.